This tutorial is based on Struts 2 Tutorial Series - Login application. 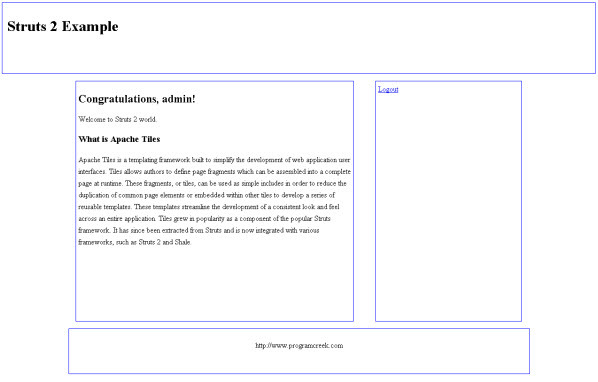 Apache Tiles is a templating framework built to simplify the development of web application user interfaces. Tiles allows you to define page fragments which can be assembled into a complete page at runtime. See the snapshot below. This application is based on the login application, it use the same environment. 4. Struts 2.0.14 (link). JAR files required for this application. Download Link 1. This is based on our Login application. If you haven't walk through it, you can do it now. Or you can also get the required file by going back to the tutorial or downloading this package. Here is the finally code. 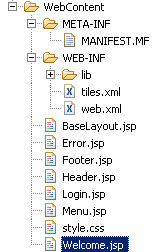 In the tiles.xml file, we have define a baseLayout using template BaseLayout.jsp. This layout contains attributes such as header, title, body, menu and footer. The layout is then extended and new definitions for Welcome page and Error page is defined. When We override the base layout, only those changed attribute will be change to be different with base layout. All other attribute remains the same with base layout. To demonstrate tiles, we add a logout function to LoginAction class. 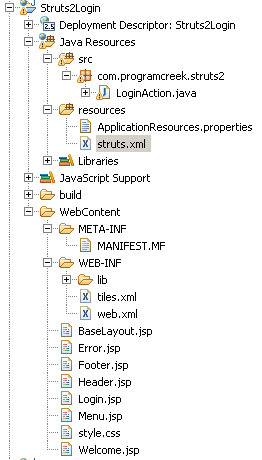 In struts.xml file, we add tags to the package to invoke tiles to handle requests. 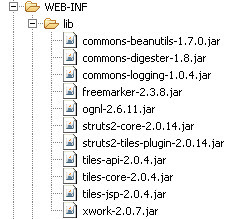 Here is all JSP files. <s:a errorText="Sorry your request had an error." Here, be careful about how to define a link to trigger an action. Welcome to Struts 2 world. as Struts 2 and Shale. style.css is used for styling the layout. please visit this website for the best trekking agencies in kathmandu at affordable price. visit www,hoteltrulyasia.com for the best hotel in kathmandu at affordable price. can i directly run Tiles Layout page .. without index.jsp page when i deployed project..
and many more exceptions are throwing. Hey man I just wanted to say thanks for taking the time to write something worth my time to read. I am all over the net and I see so much pointless content that is just written for the sake of putting something new on their page. It takes devotion to create good stuff, thanks for caring. I am little confused how you attach style.css with jquery ?? The good storage of facts referring to this topic people search, at the freelance writing service. I had got a dream to start my own commerce, but I didn’t earn enough of cash to do that. Thank heaven my fellow recommended to utilize the loan. Hence I used the auto loan and realized my dream. Many other World of Warcraft gold would do well to take notes on how the Warcraft guide illustrates the art of World of Warcraft gold making into no risk and easy to follow steps.These World of Warcraft player are very efficient in buying cheap wow gold. For many of these gold makers, this is their real job.